The Oxus treasure is the most important surviving collection of Achaemenid Persian metalwork. It consists of about 170 objects, dating mainly from the fifth and fourth centuries BC. This was the time of the Achaemenid empire, created by Cyrus the Great (559-530 BC), when Persian control stretched from Egypt and the Aegean to Afghanistan and the Indus Valley. The Treasure seems to have been gathered together over a long period, perhaps in a temple. It includes vessels, a gold scabbard, model chariots and figures, armlets, seals, finger-rings, miscellaneous personal objects, dedicatory plaques and coins It was found on the banks of the River Oxus, probably at the site of Takht-i Kuwad, a ferry station on the north bank of the river. In May 1880 Captain F.C. Burton, a British political officer in Afghanistan, rescued a group of merchants who had been captured by bandits while travelling between Kabul and Peshawar. They were carrying with them this rich collection of gold and silver objects. 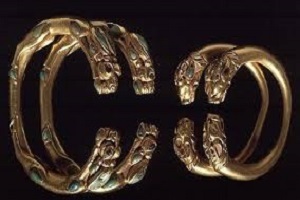 Burton bought from them a gold armlet, now in the Victoria and Albert Museum. Other pieces from the Treasure subsequently emerged in the bazaars of Rawalpindi. Some of those now in The British Museum were acquired by Major-General Sir Alexander Cunningham (1814-93), Director General of the Archaeological Survey of India, and others were obtained by Sir Augustus Wollaston Franks, who was both a curator in the Museum and a generous benefactor. In due course Franks bought Cunningham’s share of the treasure, and eventually the entire Oxus treasure was bequeathed by him to The British Museum. This embossed ornament is part of the Oxus treasure, the most important collection of silver and gold to have survived from the Achaemenid period. The treasure is from a temple and dates mainly from the fifth and fourth centuries BC. 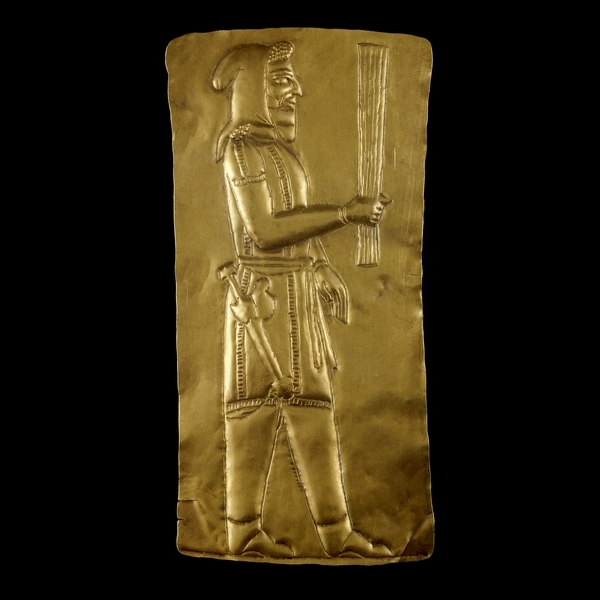 The single largest component of the Oxus treasure is a group of about fifty thin gold plaques, of which this is one. Ranging in height from under 3 cm to almost 20 cm, most have chased outlines of human figures. Some are very crude and roughly executed, suggesting local or amateur workmanship. This, however, is one of the finest examples. Like many of the other plaques, this shows a man wearing Median costume. 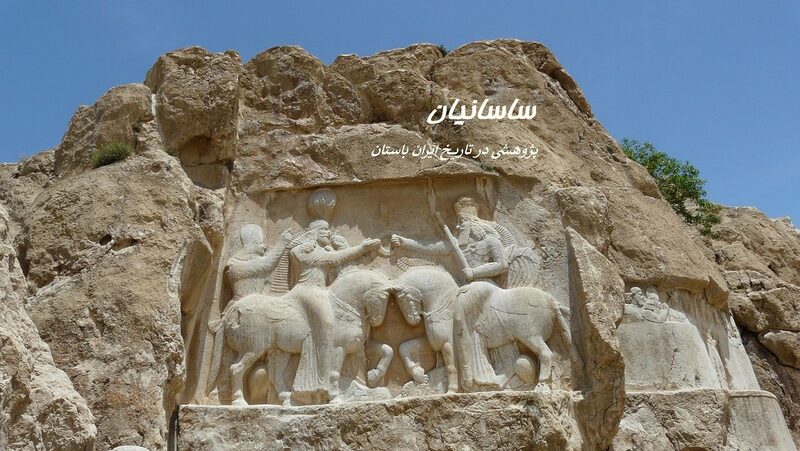 He has an akinakes (short sword) of a type depicted on reliefs at the Persian centre of Persepolis and represented in the Oxus treasure by a fine gold scabbard. The man is sometimes identified as a priest because he carries a bundle of sticks known as a barsom. These were originally grasses that were distributed during religious ceremonies.The purpose of the plaques is unclear, but they may have been votive objects left as a pious act in a temple or shrine.